Musk is the type of guy to leave your advisory council because you didn't take his suggestion only to come back later on because of reasons. dms96960, JaredTheDragon, psycros and 2 others like this. Considering that Trump has already trashed the EPA, I would be surprised if he decided to go with the Paris Accord. imronburgundy and Transparent like this. Musk doesn't understand that he can do far more with a seat on that council than he can by leaving. If he stays he can continue to lobby for many of the accords features and eventually wear them down to the point they might reverse their decision. Quitting is no better than Trumps own "I'll take my ball and go home" mentality. dms96960, JaredTheDragon, psycros and 1 other person like this. Musk is a tantrum throwing, little 'privileged' boy ... just like Mark Cuban. dms96960, JaredTheDragon, psycros and 3 others like this. I agree that he Musk could do more by staying on the council. However, I do wonder if Trump even listens to the council or not. bmw95, mbrowne5061 and Uncle Al like this. If "Paris" is in the title I know it to be no good for the US. GO Trump ! Silvernine, dms96960, psycros and 2 others like this. Musk is freaking out because he is banking on the increased subsidies to keep his empire afloat without it I don't know if he'll make it I could see the sales of Telsa Motors up for sale in the coming years. It seems the media salivates at the thought of using unflattering pictures of President Trump like the one at the top of this article. Would the media show any other world leader in a similar light, much less the democratically elected leader of the USA? In the military we used to have a slogan, "if you can't respect the person, respect the rank (office) they hold"
using pictures like this...well it's just not cricket I say! Agnomen, dms96960, JudasSheep and 4 others like this. The swamp is very large. Tremendous, even. Good riddance. Don't need that stuck up jerk anyway. Only reason he was successful with Tesla is because they are nice looking cars. Electric cars were going to happen anyway with our without him. I've done tons of research on global warming, climate change, whatever you want to call it and there just too much contradicting evidence from both sides of the argument to know for sure. Overall, we should continue to focus on making things more effecient, reducing hazardous waste, and reducing and eliminations polutants. That is just a good general goal to have, but to attempt to prove something one way or another without enough accurate data is just a waste of time. dms96960, MoeJoe, JaredTheDragon and 1 other person like this. France is literally our closest and oldest ally - and international treaties are named for the cities they're negotiated in. No respect whatsoever for that assclown. as a private citizen one of the perks of democracy is you can freely express your opinion, however I believe the media has an obligation to the public to at least try to impartially present 'the facts'. I also believe that today's media has lost whatever objectivity it has demonstrated in the past in articles on politics and society and has succumbed to ideology. Rather than give us what was said or done, and give their views on it in the editorial, the news is now the editorial, already pre-processed with a perspective. dms96960, ghostf1re, USAvenger and 4 others like this. Indeed. Just as I didn't respect Obama. That proxy terrorist doesn't deserve respect. Agnomen, JaredTheDragon, davislane1 and 2 others like this. Everyone except brain-dead hippies knows the Paris Accords have only one goal: shifting wealth to developing countries who will be exempt from most of the regulations in those BS accords. And who benefit the most? Giant first-world corporations and their Asian and Eastern European proxies. It was the same story with Kyoto. Man-made global warming has never been scientifically studied, let alone proven. Trump knows this because he has advisors in his circle who know this, and none of them are beholden to oil companies. dms96960, EClyde and JaredTheDragon like this. Good riddance. The guy isn't a scientist in any way or form, he's just a celebrity persona. Much like Zucky or Jobs, he's done no actual work in any field, and certainly knows no more about climatology than any schoolchild. MoeJoe and EClyde like this. It's always amazed me how a tech site can have so many people that fall for conspiracies. How can all the logic necessary to create the tech we have today exist, and then people fond of such tech disregard the tenets of how we got here. CO2 is a greenhouse gas. This is a fact. Pulling Carbon out of the ground, burning it with oxygen in the atmosphere, yields CO2 as a byproduct. This carbon, that was in the ground, is now in the air in the form of CO2. While the entirety of a planet's atmosphere yields huge, yuge even, amounts of data, the principle is the same. We'll make it warmer with added CO2. The correlations in the climate record show, with absurd certainty, that human's contributions of CO2 have warmed the planet. This stuff is really basic...you can take a Geology 101 class for crying out loud, and go over the data pulled from the ice cores and do your own work. You can't do any work on this, and then come to a logical conclusion that "we don't know why the world's warming. If you say you've done a lot of research and you find the evidence inconclusive...I'm going to call you out. You didn't do your research. I'm sure there's lots of paid trolls on the webz, along with armchair warriors that get a dopamine release at "internet debates." But I've never met a real "climate sceptic." Either your a *****, or you have an angle (monetary funds for research coming from oil/etc, enjoying the dopamine drip from internet anger) if you don't understand man made climate change. MoeJoe, Silvernine, Bubbajim and 3 others like this. Well it's more like he would have to break the US's promise and back out of the Paris accord. Obama bypassed congress and already ratified the Paris Agreement during his last term. Yes, because if you look at everything on the internet of course you are going to have voices that say it's bad. The guy in his underwear on the coach and the republican paid surveys are against it. Pretty much everyone else, including much of the whole world (Do you know how many pollutinous countries signed the Paris agreement?) are well aware that Global warming is occurring. Why don't you go and find some sources that are against it, I bet in one way or another I can prove that they either have a vested interest in going against global warming or that they aren't a vetted publication. @ScorpionKing: Yes, we're all aware of what CO2 is. No, it doesn't cause a greenhouse planet effect - something the Russians showed us with the Venera landers on Venus decades ago. Insolation barely even penetrates the atmosphere. Venus is hot because it is spinning backwards in the solar charge field, causing magnetic friction (basically). Not because its atmosphere traps heat, but because it is recycling and emitting the incoming radiation from the sun more readily than other planets which spin along the same axis as the sun. Any Astronomy 101 class could have taught you that. The main "source" of greenhouse planet theory has been falsified since the 1990s. CO2 emissions should be chopped simply because it's a pollutant. @Evernessince: The amount of people believing a hypothesis has absolutely no bearing on its validity. Please form an actual argument. 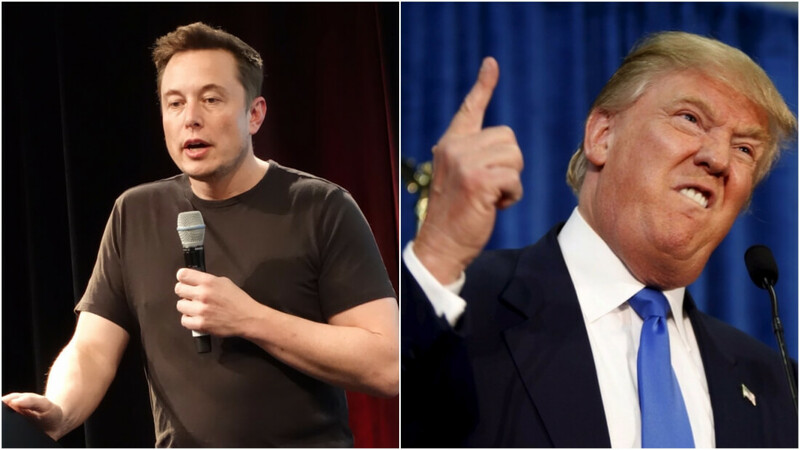 Regardless, neither these climatologists nor Elon Musk can even tell us what heat is, much less how the Earth generates its heat. Spoiler alert: it generates it in almost the same way as Venus, by recycling and emitting solar charge. The sun, Jupiter, and our position in the galactic plane are the three chief sources of incoming heat. This is why the ice ages occur with usual repetition and time frames. We are currently a bit late for the next one, but well within margins of error. Can you tell us what heat is, either of you? Let's hear it. Look up predictions of global warming sometime. Another spoiler alert: they've all failed. Not one of their models is accurate. The Earth may be heating or cooling, but it's due to solar cycles and our proximity to Jupiter, not because people spray aerosol cans. Agnomen and ghostf1re like this.